Suitable for Playback Output Level alignment of any Cassette Tape Deck. Only new 17u TDK, MAXELL or TEAC tape is used when recording. To order a Dolby Level Cassette (A-BEX TCC-130) choose the option "1-7/8 ips 200 nWb/m, 400 Hz Dolby, A-BEX TCC-130" below. Set Playback Output Level of each channel to match with "Dolby" marks on the "VU"-meter's scale.This Cassette can be used for decks with "DD" Dolby marks on VU-meters (not suitable for Nakamichi decks). To order DIN Level Cassette choose the "1-7/8 ips 250 nWb/m 315 Hz 0dB DIN/IEC" option below. Suitable for Playback Output Level alignment of European and Tascam122mk3, 112Rmk2, 112mk2, 134B SYNCASET Cassette Tape Decks. Set Playback Output Level of each channel to match with "0 dB" marks on the "VU"-meter's scale. 3. International Courier with Tracking number (this option is NOT available for customers from Russia). Delivery target from 5 to 10 working days. Up to 8 items per a single package for combined shipping. $49.00. Please note for courier delivery the shipping address must be written in English. Provide your shipping address written in English. 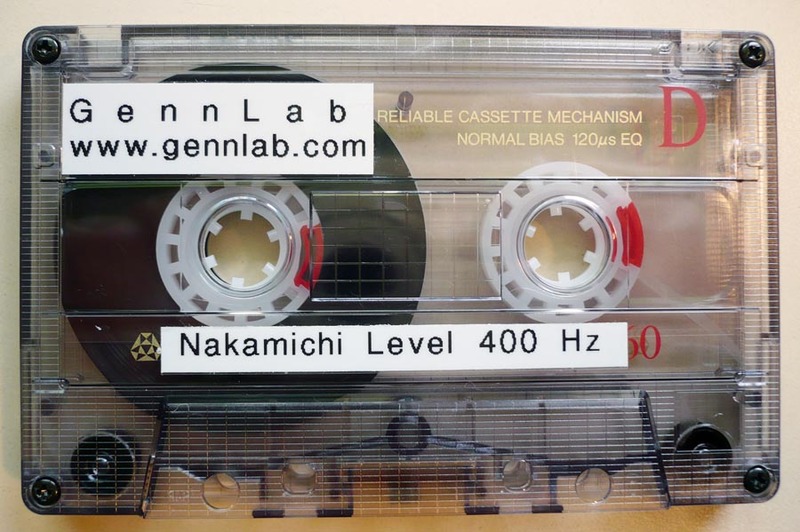 To order 400 Hz Level Tape for Nakamichi tape decks alignment choose the "1-7/8 ips Nakamichi Level, 400 Hz" option below. Follow the procedures of the Nakamichi Service Manuals for those decks. To specify Cassette Speed, Fluxivity Level and Frequency click on the arrow below. On completion of your PayPal shopping cart page, click on the "Continue Shopping" button. You will then be redirected back to your last purchase page. The correct shipping fee can then be determined from the Shipping options listed below. 10 kHz, 12.5 kHz, 14 kHz) is equivalent to Pioneer STD-331A/341A cassettes. *Please note all prices are in $US. Your order can not be processed until payment has been made for shipping. Follow the instructions below. To order a cassette equivalent to TEAC 1-7/8 ips or 3-3/4 ips Cassettes go to the TEAC Calibration Cassettes page. To order Tandberg Standard Level Cassette choose the "Tandberg Cass. No.24, 250 nWb/m, 1000 Hz " option below. Suitable for Playback Output Level alignment of Tandberg cassette decks (TCD-910 etc.). This cassette is equivalent to "Tandberg test cassette No.24" cassettes. Please note, with Economy shipping listed above without Tracking Number , our responsibility ends at the post shop reception. We can E-mail the picture of the parcel taken at the New Zealand Post Shop reception desk and the Post Shop receipt showing the date and time of shipping, but no Tracking Number. Please note, because New Zealand Post does not directly control all parts of the delivery chain, it cannot guarantee that the item will always reach its destination within the delivery target. Delivery to areas outside major cities, or where your item is dutiable or held in Customs, may take longer. To order a 15 ips Duplicator Standard Level Cassette choose the "15 ips Duplicator 160 nWb/m, 315 Hz DIN/IEC" or "15 ips Duplicator 250 nWb/m, 333 Hz DIN/IEC" from the Cassette Fluxivity Level option window below. Suitable for Playback Output Level alignment of cassette duplicators (OTARI DP-4050C2 etc.). Option 3 International Courier with Tracking number is not available for customers from Russia! To order SONY P-4-L300 Standard Level Cassette choose the "1-7/8 ips SONY P-4-L300 0dB Level, 315 Hz" option below. Suitable for Playback Output Level alignment of SONY TC-K777ES (ESII) Cassette Tape Decks. Set Playback Output Level of each channel according to the Service Manual. To order SONY P-4-L81 Standard Level Cassette choose the "1-7/8 ips SONY P-4-L81 0dB Level, 333 Hz" option below. Suitable for Playback Output Level alignment of SONY TC-K777 Cassette Tape Decks. Set Playback Output Level of each channel according to the Service Manual. the "1-7/8 ips Tascam 122mk3 "0 VU" " option below. Set Playback Output Level of each channel to match with "0 dB" marks on the "VU"-meter's scale. "3-3/4 ips 250 nWb/m, 315 Hz DIN" option below. To order a 3-3/4 ips Dolby Level Cassette choose the option "3-3/4 ips 200 nWb/m, 400 Hz Dolby" below. Set Playback Output Level of each channel to match with "Dolby" marks on the "VU"-meter's scale. To order Pioneer Standard Level Cassette equivalent to Pioneer STD-331B/341B cassettes choose the "1-7/8 ips Pioneer Level 315 Hz 160 Wb/m" option below. 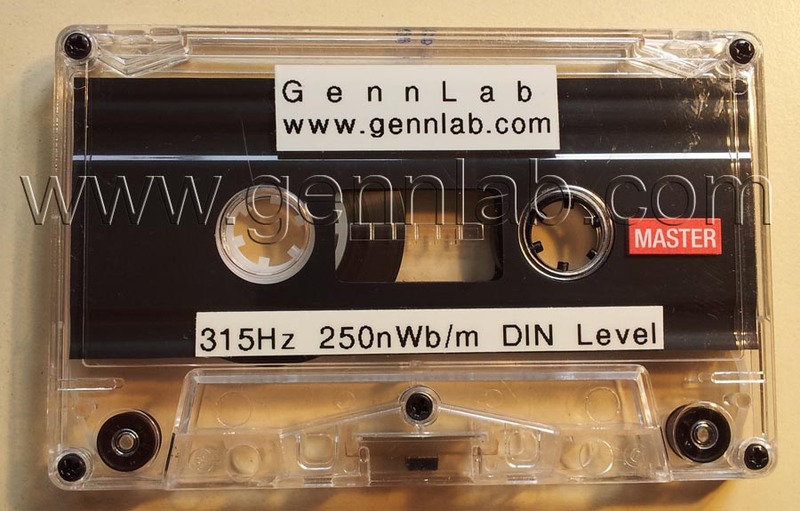 The set of this cassette plus Frequency Response Cassettes (40Hz, 63Hz, 125Hz, 250Hz, 315Hz, 500Hz, 1kHz, 2kHz, 4kHz 6.3 kHz, 8 kHz, 10kHz, 12.5kHz, 14kHz) is equivalent to Pioneer STD-331B/341B cassettes.